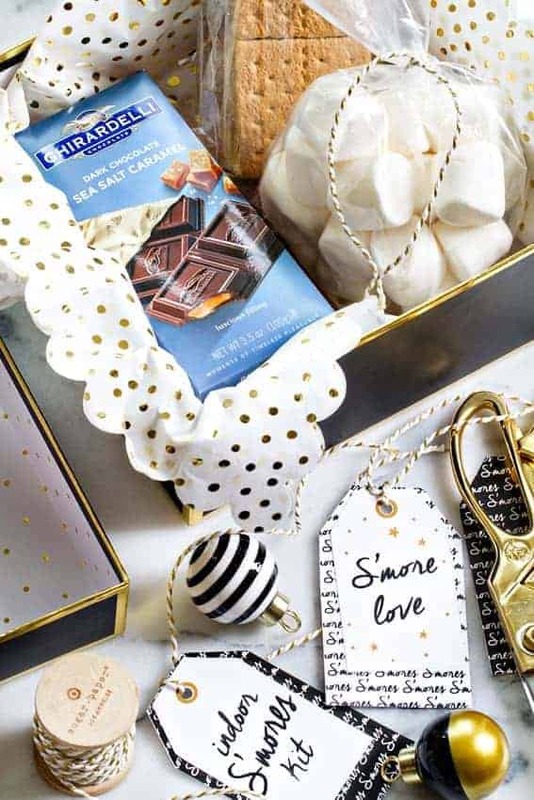 An Indoor S’mores Kit is the perfect last minute gift for coworkers, neighbors and friends. 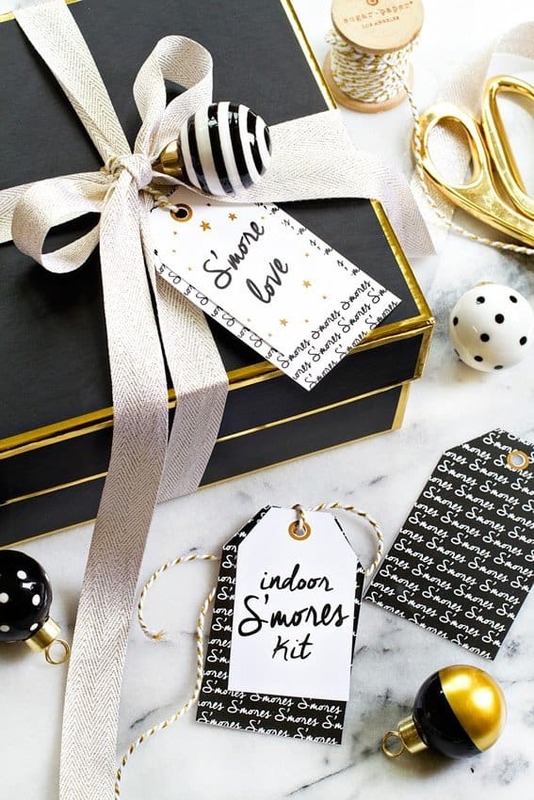 With an adorable printable tag, your gift will really stand out under the tree! So Christmas is just days away and I’m still shopping. And judging by the line wrapped around the produce section at Target yesterday, you might be too. Every single year I make a vow around the 20th of December that I am going to change my last minute ways, but here I am paying $25.00 for 2-day shipping and staring at a stack of unwrapped gifts. When I started brainstorming homemade gift ideas to share with you, I knew I wanted the gift to be something that you could put together in just a few minutes, but I also wanted it to be festive and super cute. 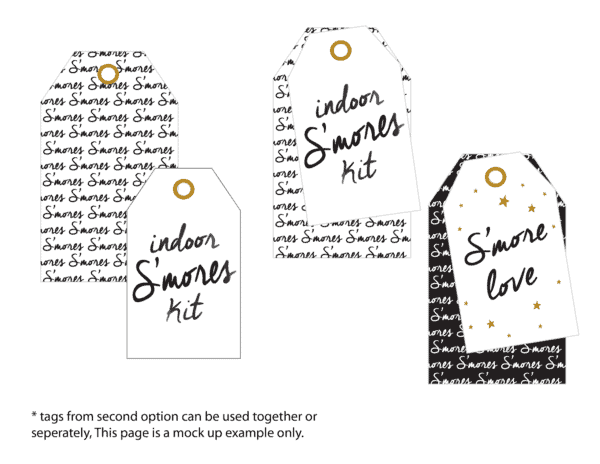 That’s how the idea for a homemade Indoor S’mores Kit was born. And since I’m such a sucker for adorable packaging, I wanted to take the guesswork out of the presentation by offering you free printable tags. If you’ve been reading My Baking Addiction for a while, you know that indoor s’mores are my jam. They were my number one pregnancy craving and most definitely the reason we have a chocolate-loving toddler on our hands. Whether the marshmallows are toasted with a kitchen torch or simply poofed up in the microwave, I can’t refuse that ooey-gooey goodness. I mean, who doesn’t love a s’more? 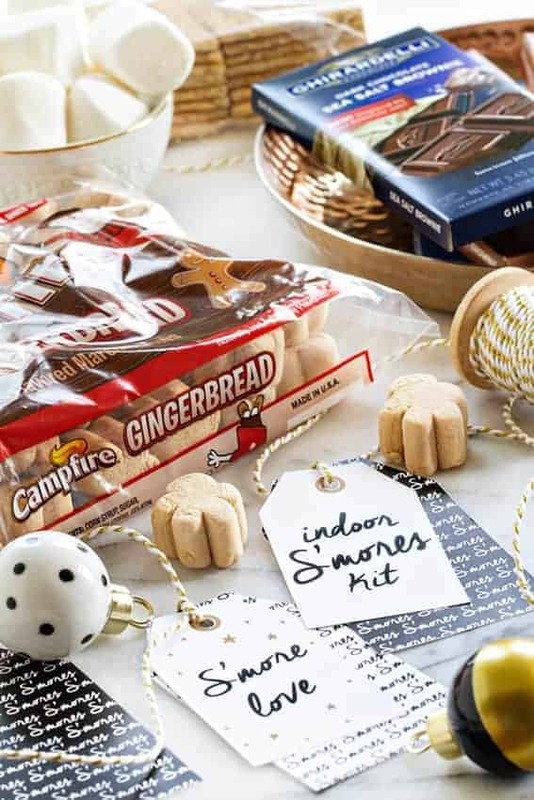 Assembling an Indoor S’mores Kit couldn’t be easier. You need the basics: graham crackers, soft, fluffy Campfire® Marshmallows (I especially love the cheery Gingerbread variety) and a bunch of chocolate bars. Grab a box, a few sheets of tissue paper, some ribbon and the free printable tags, and you’re good to go! Of course you can kick the fancy up a notch by adding pretty bulbs or other festive gift toppers, but that’s totally up to you! If you’re interested, Sugar Paper for Target has a great line of holiday items that coordinate perfectly with our printable tags. The great thing about these tags is that they’re not overly holiday themed, so they can be used for so many other occasions. Think wedding favors, Valentine’s Day gifts, and so many more! 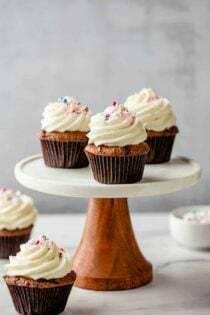 We even created a Marshmallow Madness Pinterest board where we’ve pinning loads of delicious marshmallow recipes for the holidays. Like this Cranberry Fluff and Cinnamon Marshmallow Mug Brownie. If you’re looking for more homemade last minute gift ideas that go beyond Christmas cookies, be sure to check out my Homemade Hot Cocoa Mix (with printable tags), Infused Vodka and Cinnamon Vanilla Oatmeal Body Scrub. To use, click below to download the file. 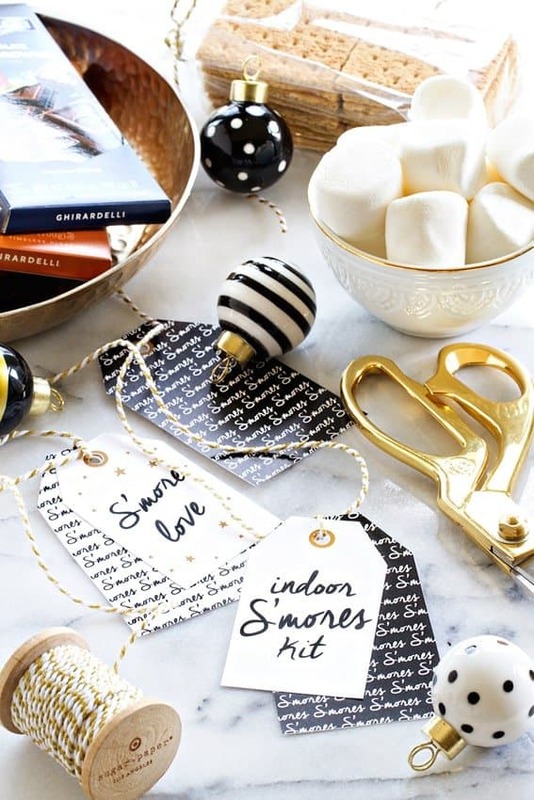 Print tags on card stock, cut out, and attach to the Indoor S’mores Kit with twine, yarn or ribbon. Tags were created in collaboration with Campfire® Marshmallows for personal use only. Oh my gosh, this is absolutely adorable! Wish I had seen this before the holidays, but I’m pinning it ASAP for next season… so cute! Thank you, Michelle! I hope you had a great holiday season!